– Front entry and facade are almost complete. – Landscaping is taking shape. …LifeTown is nearly ready to welcome the tens of thousands of participants. – Windows and flooring are being installed throughout. – Pool tiled and equipment installed. – Cabinets in the kitchen and art rooms are just waiting to be filled with supplies. – Life Village storefronts and therapy rooms are nearly complete and fit outs of the spaces are being installed. This week the glass was installed on the main entrance. The bright entrance will welcome thousands of people each week as the ascend the Musical Stairs of Joy and enter LifeTown. 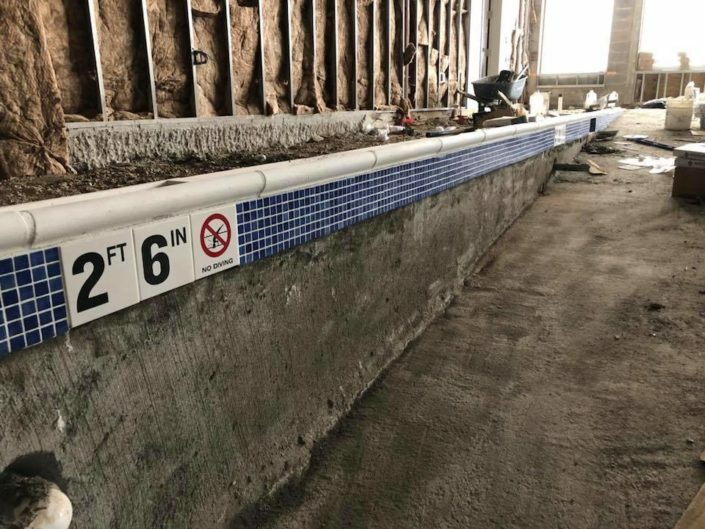 The pool started to get the finishing touches… “No Diving”, but the zero-entry 90-degree-water will be very welcoming! Theater acoustical panels were also installed this week. Thank you Joanie Schwarz for the photo shoot yesterday! Get ready for the “MyTown is LifeTown” campaign coming soon… as we prepare to move into LifeTown!